The project site of the future mosque of La Beaujoire enriches a place where several buildings of worship were built side by side. Indeed, the current site is already home to three churches namely the Church of St George, the Protestant Evangelical Church and the Orthodox Church St. Basil. The presence of a mosque for muslims in this plaza of religions allows other communities to know more about the beauty of Islam and encourages discussion between religions. 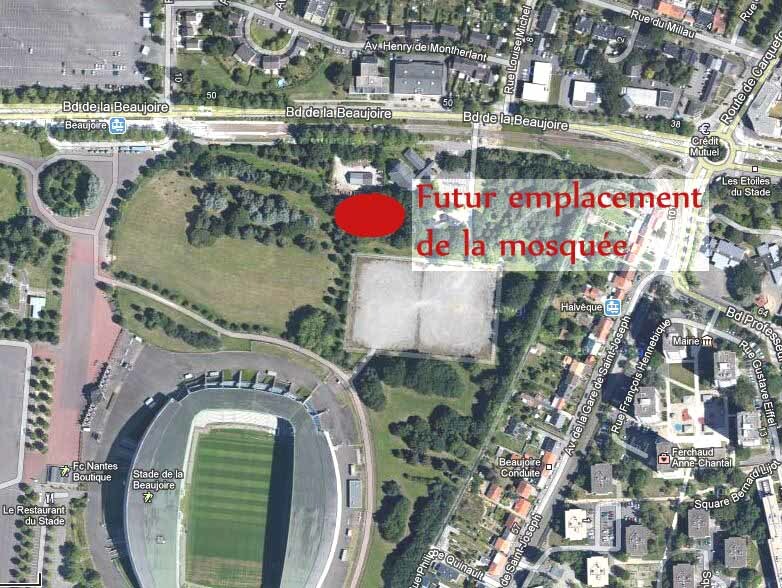 Located a hundred meters from the terminus of the tram line 1 (Terminal de la Beaujoire) and 2 minutes from junction 40 of Nantes city ring road (beltway) (Porte de la Beaujoire), the future mosque site enjoys a strategic location in terms of accessibility. The image below shows an aerial view of the site of the future Mosque & Cultural Center.